Ordering contact lenses online for the first time? Perhaps you want to know how to browse our website more quickly and efficiently, well, this resource is essential. 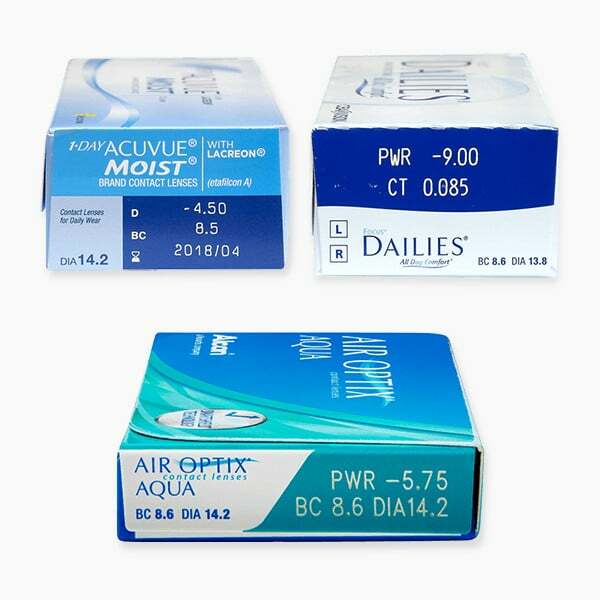 We make ordering contact lenses online a pain free experience. You'll confirm your order in the blink of an eye with our easy to navigate website and simple ordering process. This simple guide shows just how hassle free buying contact lenses from Vision Direct is. Choosing your lenses is quick and easy. The fastest method to order your new contact lenses is when you already know the brand you want. With a brand in mind type your choice into the search bar found at the top of every page. Alternatively, explore our range by clicking 'Contact Lenses' in the menu at the top left of every page. You can filter lenses alphabetically, by popularity and price. On the left-hand side of the page you can also choose to browse by brand or select the type of lenses you'd like, whether it's daily, monthly or extended wear lenses. If you are considering a different lens to your prescription we recommend seeking the advice of your optician. Your optician will save you time and discomfort by helping you choose the ideal lens for your eyes the first time. 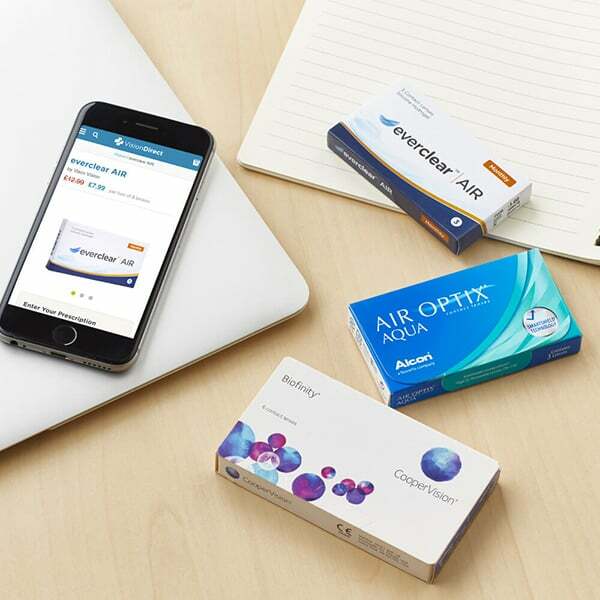 And, if you previously purchased lenses from the optician, (welcome aboard), check out our Boots' equivalent lenses and Specsavers' easyvision equivalent lenses tables. There you'll find the same lenses you're used to, the only difference is we buy the lenses direct from the manufacturer. They have different names and box designs but don't worry the lens specifications are the same and the prices are often much cheaper. Find your lens and see how much you can save today. 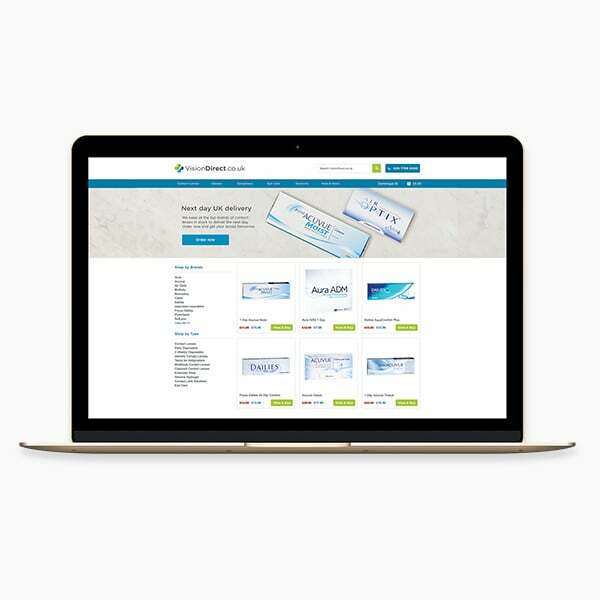 When viewing a product, to purchase you first need to fill in your prescription details. It's a pain-free process. Enter your details in the prescription form on the right-hand side of the page. If you don't have access to the results of your eye test you can still buy contact lenses without your paper prescription. You can find your lens specifications on the side of your current contact lens box. All the essential information is printed on the side or back of every box. If you have different prescriptions for each eye always check the details for both your right and left eye. Remember to only use details that you have been prescribed in the last 2 years to ensure that your new lenses are comfortable and that they correct your vision accurately. Now you've entered your prescription details choose how many boxes you want to order per eye, remember some contact lenses are cheaper the more you buy. Also, you'll always save on delivery costs when you buy in bulk, just spend over £49 for free delivery. When you are satisfied with your order click 'Add to Basket'. If this is your first purchase with us you'll need to register a customer account - it's quick and easy, and it speeds up repeat orders. You'll now see 'Your Basket' with a recap of the items you've selected, each product will have a summary of the eye it's for and the prescription details you've entered. When your 100% satisfied click 'Proceed'. On the next screen you will enter your payment and delivery details. The screen will now include your order summary, selected delivery and billing addresses plus an estimated delivery date. When happy click 'Place Order' and your order will be confirmed. At this stage you can set preferences for your account including whether you'd like to receive email reminders to reorder and whether to submit your prescription details for us to verify with your optician, delivery is quicker if you don't. With that, you've successfully ordered your contact lenses online. We think you'll find ordering fast and simple, but if you can't find the answer on our FAQ page, ask us a question via our web chat, call our friendly customer service team on 020 7768 5000 - UK, 1 800 870 0741 - US, or email us at help@visiondirect.co.uk. We're available 24 hours a day, 7 days a week.